Just practice today. No holes played. Ace in the hole: During yesterday’s pro-am, Honorary Chairperson Meg Mallon greeted each group as they arrived on the par three 15th tee. Along with exchanging pleasantries, she joined in with a tee shot of her own. But the group hosted by Mindy Kim was in for a special treat. Meg holed out for her 15th career ace with a six iron. 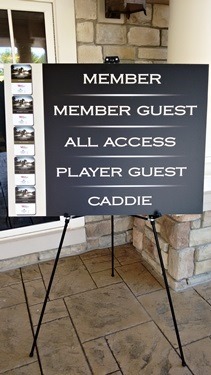 We have access to the clubhouse this week but I was unsure what exactly that entailed. So I asked the lady directing traffic inside and found that we were welcomed to dine at the dog and burger buffet, just inside the door, for the paltry sum of $12 and change. That was with the caddie discount she added. Not exactly the $2 dogs and burgers of last week. I had dinner with Jeff and Wayne at Applebee’s this evening. I had the chicken finger basket in honor of Chad and Wayne had a side of vegetable for the same reason. This entry was posted on Thursday, July 2nd, 2015 at 7:02 pm and is filed under Uncategorized. You can follow any responses to this entry through the RSS 2.0 feed. You can leave a response, or trackback from your own site.